This involves using treated and untreated waste water to meet the irrigation needs of farming activities. This saves on water resources upstream and reduces pollution downstream. The waste water can also often represent a source of nutrients for the plantings. Waste water is recycled extensively in regions suffering from water shortages, mainly Japan, the Mediterranean basin (Israel, Turkey, Cyprus and Spain), the United States (especially California) and also Asia and the Persian Gulf. Irrigation can increase the productivity of farming activities from 100% to 400% and allow certain crops to be grown in regions with unfavourable environmental conditions. Agriculture accounts for 70% of the water taken, a figure that reaches 95% in certain developing countries. Recycling waste water is one solution in facing up to the increasing demand for water resources for irrigation. At the same time, it is a natural way of reducing the environmental impacts and providing the nutrients (mainly nitrogen and phosphorous) which will fertilise the soil. Waste water recycling is above all suitable in regions with limited water resources compared with existing demand. And yet, some crops are better suited than others to this technique based on the inherent risks of consuming products irrigated with recycled water. Crops to which recycled waste water applies include barley, corn, oats, cotton, avocado, cabbage, lettuce, sugar beet, sugar cane, apricot, orange, plum, vine, flowers and wood. The FAO (Food and Agriculture Organisation of the United Nations) proposes a crop classification based on the level of risk for consumers and farmers. - Forage corps or other food crops for animals that are harvested and dried in the sun before consumption. - All crops not identified as "high risk" if sprinkling irrigation is used. - Sprinkling irrigation, independently from the type of crop, at least 100 m from residential areas or places of public access. Waste water recycling involves using the water, whether or not pretreated, for new uses (irrigation, pastures, golf courses, gardening, cooling power plants, etc.) rather than releasing it into the environment. - and secondly, the infecting dose, the exposure and the susceptibility of the population exposed. Primary and/or secondary treatments are generally necessary so that the waste water achieves the quality required for a new use. Therefore, in addition to all the aspects involved in the design of a traditional irrigation system, the aspects relating to the capture and treatment of the water must be defined clearly to implement an irrigation system that uses recycled water. Identification and characterisation of the irrigation system’s goals and requirements : irrigated crops, acceptable concentrations of chemical substances and micro-organisms, the water flow rate required by the irrigation (and its variation depending on the time of day and of the year). The acceptable concentrations and the flow rates are determined according to the types of crop involved, the soil characteristics and the climate in the region. Identification and characterisation of potential recycled water sources : the concentrations of chemical substances and micro-organisms present and the water flow rates available. The characteristics of any necessary additional treatment : This level must be defined based on the conditions of waste water to be recycled and the needs of the irrigation system. The need for recycled water storage and distribution facilities. Storage facilities can be necessary to ensure the availability of water under the fluctuations of supply and demand. The distance between the source and the site to be irrigated is one factor that will influence the economic feasibility of the project. The environmental impacts of the irrigation system, above all in terms of soil use, the region’s hydrological conditions and the impacts on the water tables. The water must be checked for certain substances to ensure a good quality for the irrigation system. Salinity : high levels of salt in the ground can reduce the productivity of the planting and even lead to its total failure. The quantity of salts present in the water used for the irrigation affects directly the soil salinity. This quantity can be measured by the electric conductivity of the water or the quantity of total dissolved solids. Sodium : a high proportion of the sodium concentration over the magnesium and calcium concentrations (above 3:1) can reduce soil permeability. Plant growth is therefore affected by the non-availability of water in the soil. Waste water normally has this particularly high proportion. Chlorine : chlorine concentrations can damage most plants from 5 mg/l and the most sensitive from 0.05 mg/l. Waste water can have high chlorine levels based on treatments carried out upstream. Trace elements of heavy metals : high concentrations of nickel, cadmium, molybdenum, zinc, copper, lead and mercury can be poisonous for plants and animals ; they can be affected by the propagation of some of these elements the length of the food chain. During a recycled waste water irrigation project, it will perhaps be necessary to raise the awareness of all the parties involved to the existing issues. Firstly, the safety of consumers and farmers must be guaranteed, by demonstrating that their health is not in danger. Secondly, the environmental impacts must be controlled. A transparent approach is the only way to ensure that the project is accepted by the population, farmers and governmental bodies involved. To protect the population, a conventional rule adopted when recycling waste water is to paint the pipes and equipment in a distinctive colour, usually purple. The use of recycled water must also be signalled by posters and panels. - Using waste water is an alternative to the water shortages faced by some regions on the planet. - This represents a source of reliable water for the farmers. In addition, the recycled water normally contains nutrients that reduce fertilisation costs. - Waste water recycling reduces the environmental impact caused by releasing effluents into the natural environment. - Major modifications to treatment plants may be necessary to ensure the quality of the water required for irrigation. 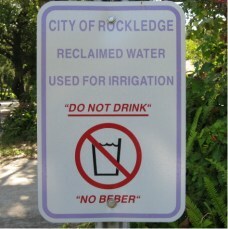 - Restrictions linked to the public health issues are one of the main drawbacks to irrigating with recycled waste water. This can cause bureaucratic and political problems and of acceptance by public opinion. - An irrigation project using waste water as its source is not always economically profitable. The direct costs of a recycled waste water irrigation system are linked principally to the necessary project infrastructure. This includes the potential costs of modifying, extending or creating effluent treatment plants, the necessary piping and reservoirs and adapting the water distribution mechanisms (especially sprinkling and micro-irrigation techniques). Thought must also be given to the operating and maintenance costs of the treatment and distribution system. More or less indirect costs include the costs of restrictions to agricultural production, the costs of protecting farmers and other workers involved, costs relating to public health, the long-term effects on the ground and environmental costs (very specific, normally linked to discontinuity in the water cycle). On the other side, the benefits generated by this type of irrigation system can include the reduced water capture costs (mainly pumping costs), savings on fertilisers and effluent treatment (if the nutrients are not removed), reduced losses from improved reliability of the system and, lastly, the environmental benefits (that are normally greater than the costs) : less water captured from rivers and water tables and less pollution from spillage of effluents into the natural environment. Spain is another country that often uses recycled waste water to deal with the shortage of water resources that affect some regions in the country. The Castell-Platja d’Aro effluent treatment plant, inaugurated in 1983 on the outskirts of Barcelona, has been providing water to the region’s farmers since 2003. The station produces 5.50 Mm3 of effluent a year, of which 0.98 Mm3 is treated at tertiary level. The treated water is used for agricultural irrigation (0.216 Mm3/year), watering golf courses (0.510 Mm3/year) and filling water tables (0.213 Mm3/year). The remaining effluent is released into the sea. The farms in the region mainly produce milk, their own forage, cereals (winter) and corn (summer). In the municipality of Llagostera, the farmers can pump water from depths of 80 to 120 m. In addition, the available waters has to be shared with the other residential users and nearby farmers. The use of recycled water ensures the availability of a water source for the farmers. On the one hand, the golf courses required tertiary-treated water as they are a place of public access where there is a direct contact with the grass. On the other hand, the tertiary treatments remove the nutrients that would be beneficial to agriculture. The Catalonia Water Board therefore has two options : produce two effluents with two separate treatment levels or a single effluent treated at tertiary level. The first option is not economically advantageous due to the high costs in having two separate treatment lines, which not be justified by savings in artificial fertilisers made by the farmers. The option of increasing the production of tertiary-treated effluent, building new pumping stations and installing new pipes and reservoirs would require an investment of 7.7 million euros, including 16% for the treatment facilities, 48% for the pipes and 3% for the storage facilities. This investment would be shared in proportion by the users (farmers, golf courses, municipalities and Water Board). The availability and reliability of the recycled water and the reduction in pumping costs make the investment attractive for the farmers and the golf courses. The initiative also reduces the pressure on the water tables in the region and the quantity of effluents released into the sea (bearing in mind that this is a tourist area). - AFSSA : "Re-using treated waste water for watering or irrigation"
- Manual on the treatment of water containing very detailed technical aspects : MWH. Water Treatment – Principles and Design. 2nd ed. John Wiley and Sons : New Jersey, 2005.